I previously mentioned that I had decided to make my own Strat. I had already borrowed a Strat copy and drawn an outline around it. I now needed to get my hands on a nice chunk of wood. I did some investigation and found that real Strats were made of ash or alder. My friend of a friend (the one in the timber industry) informed me that he could more easily source some ash, so I happily gave him the dimensions I needed. The wood had to be 45mm thick and at least as big as the outline template I had made. A little bit extra around the edges gave me some room for avoiding blemishes, etc., or placing them where they would not be seen (like under the scratchplate, for example). Here's a photo of the chunk of wood as it arrived. In fact it is two pieces glued together. It arrived already glued, and importantly, had been well dried out. 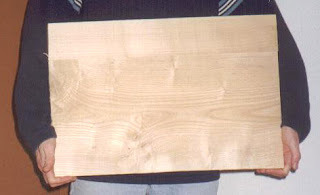 Unfortunately this wasn't the "swamp" ash used in most real Strats, but the ash that is more commonly used in the construction of baseball bats. That stuff is solid! It also weighs a tonne. This was something I wasn't going to realise until I finished the guitar and picked it up for the first time. Anyway, learn from my mistake; get "swamp" ash. Luckily the ash I got still gives great tone.